Is there such a thing as zombie rock? Certainly Beat Happening thought so. 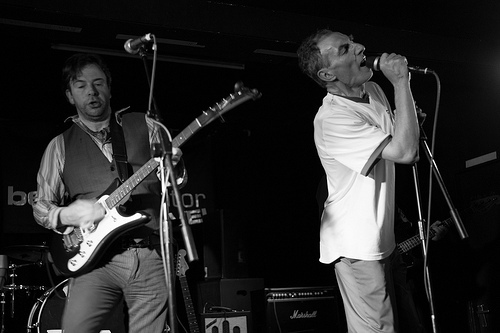 There have been several occasions in the last few years at Dundee gigs (never elsewhere, for me) when the band has either walked backwards into the audience after a short while (Edinburgh School for the Deaf, Gong Fei), or gone ape from the off (Gropetown, who crawled all over the floor). The intention never seems to be to break the fourth wall, more to bend it outwards, heightening the claustrophobia of a small venue and generally creating disorder. It can be an impressive thing to watch, the first few times, but it also screams ‘gimmick’, and even the mention of the fact that Vladimir do it too bored me a bit – a good hunch, as it turned out: they were heavy, solid, oppressive. Not my thing, generally. 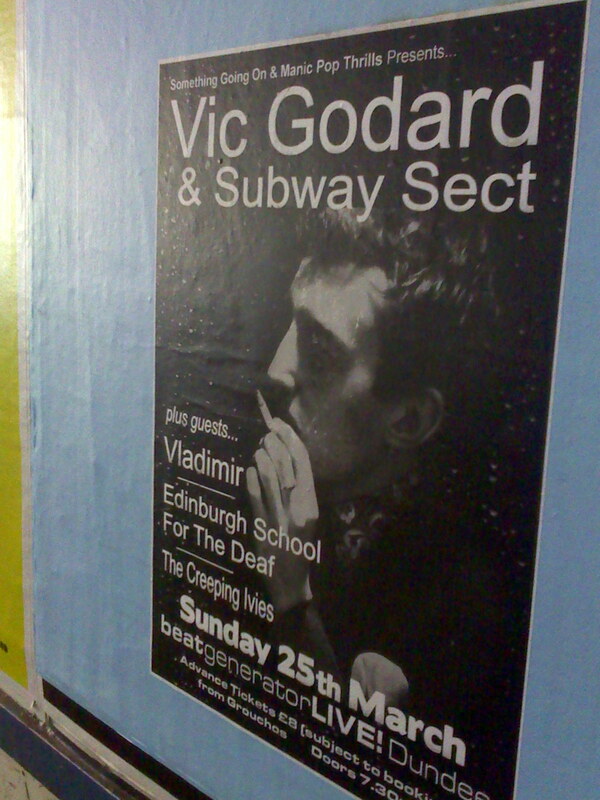 What surprised me about Sunday’s support bands was how thrilling Edinburgh School for the Deaf were. As far as I can tell, they have a good claim to be the instigators of this zombie trend, which is lucky, because they are absolutely ridiculous at it. Where Vladimir stood stocky and inert, save for some very deliberate primal scream therapy at the end of their set, Edinburgh School for the Deaf were runts rescued from drowning, all curvature of the spine and (from the singer) witch-like graspings at the air; the twin guitarists were like the Magic Band with rigor mortis. You wouldn’t want to employ these people. They would not shine at assessment centres. The previous times I’ve seen them, they’ve impressed without shifting a basic suspicion of all this affectation. This time... I don’t know, it just clicked. The moves were endearing because they were so dumb, powerful because so powerless. Of course the freaks get the sympathy, how could I forget that? And then, having me at their mercy, they dropped an incredible ‘Love is Terminal’, unrecognisably slow and turgid to begin, then bursting its banks into hurt wonder at the half way mark. Sung by the bassist, who stood on a monitor with his head touching the ceiling, apparently staring straight into a green stage light, inches from his face. It was wonderful. The Creeping Ivies, on first, did their fun ’50s thing, complete with Vic Godard and Slits riffs (from ‘Johnny Thunders’ and ‘Love und Romance’, by my reckoning), the main difference from last November was the drummer’s smart and showbiz red jacket. They were a touch too loud, in common with the Totally Wired DJs who decreed by volume that no person should speak to another person between any band whatever, as long as the evening should last, because they wanted to play several Fall songs and ‘Candyskin’ at us (it felt like ‘at’ rather than ‘to’). Which admittedly sounded great, but it would have been nice to catch up with our friends, y’know? Vic kicked off a sharp set with ‘Best Album’, which got me thinking about its applicability to non-album settings, and how he is always re-arranging his catalogue to form different ‘best albums’ from the same material; how it’s a constant and evolving process, and the magnificence of We Come As Aliens is not what the song’s about; how they’ll never leave, because they’ll never be done, which is a cheering thought. Freed from the encumbrance of a guitar for the most part, Vic was free to move, and what we got – joyously – was the poppiest set I’ve seen him play, edging towards the planned 1979 Now album with ‘Holiday Hymn’ and a song I didn’t know which sounded even better, moving on to ‘Won’t Turn Back’ from The End of the Surrey People with some preamble about its mid-90s Britpop context. Original Sect bassist Paul Myers, who has been away from the fray for some time, responded with curiosity to this, but Vic cut him short, assuring him he didn’t need to know about the context. That trio of songs made for the heart of the set, and for sky-high hopes about 1979 Now. It is far more interesting in prospect than 1978 Now, which documented a period already covered by contemporary recordings (albeit not a complete set). A properly recorded LP of Vic’s take on northern soul is something the world definitely needs to hear. They played ‘Ambition’ and ‘Chain Smoking’ too, of course, the latter with manic abandon, which somehow they contrived to muster within the bounds of the stage. S. and I made our way home, and hopefully annoyed the neighbours singing the other version of ‘Chain Smoking’, in as close an approximation of the cracked Godard croon as we (well, I – she sang it properly) could muster. Any chance of that one next time, Vic? Review delayed a few days waiting for Chris’ fab pics to emerge, and also because I didn’t want to offend Andy, who organised the gig, by not raving about his beloved Vladimir. But that is daft – another time, I’m sure. I’ve been swithering about whether to write about this together with Scenes of Clerical Life, but by the time I get to the end of that I’ll probably have forgotten too much about Adam Bede. The two do seem to go together, though: George Eliot’s first work of fiction, and her first novel. Both are about village life, the division between labourers and gentry, and the special position of the clergy (with learning and moral weight, but without wealth) within that context. This much is familiar from Barchester Towers, which was published at roughly the same time (1857; Scenes came in 1858, and Adam Bede in 1859). There is a difference in the setting: Barchester’s events take place in the 1850s, whereas Adam Bede begins in 1799, situated very carefully at a time when people could still remember John Wesley (d. 1791), and before the Methodists ruled against women preachers in 1803. This allows the introduction of free spirit Dinah Morris, who preaches a long sermon on the green at Hayslope, Loamshire, which takes up most of chapter two and put me off reading the rest of the book when I first tried (in September 2000, says the receipt, doubling as a bookmark). My mistake was to assume that because the sermon was didactic, the book must be too. In fact, the reception of Dinah’s doctrine is cordial and interested, if not, for the most part, enthusiastic. People are drawn to her, personally, and seem to overlook the religious content of what she says, because she is incredibly kind and generous. In an early example of this, she stays with Adam’s mother Lisbeth Bede after the drowning of her wastrel husband Thias, gently comforting her and doing the cleaning, preparing the breakfast. Tragedies like this aside, Dinah finds that the people of Hayslope are too contented with their lot, and returns to Snowfield, Stonyshire, where there is a greater availability of suffering to succour (there is a mine and a mill, and nothing grows; it symbolises industrialisation and commercialism, which compares unfavourably with Hayslope’s older squire landowner / farmer tenant economy). Lisbeth complains to both her sons at different times that they could marry her and bring her back. Seth, Adam’s younger brother, does propose, but is rejected in favour of Dinah’s calling. Does this sound like an awful plot yet? I remember, years ago, coming across an objection to Silas Marner as it was (is?) taught in schools, and it was not until then that it occurred to me that, yes, it is a massively clunky plot device to take a miser, to castigate the miser, and then halfway through the book to have his gold all stolen, and an abandoned baby put in its place, the better to bring about his redemption. Reading the book, all this had seemed perfectly fine, effective, affecting. The same is true of Adam Bede – many of its broad strokes are crude, but it makes you care about the characters; the real action is not at the level of plot, but in the beautifully observed relationships, within a rather unsubtle folk tale structure. Stephen Gill’s excellent introduction to this Penguin edition identifies the extension of sympathy as George Eliot’s primary aim in her fiction, and this sympathy is a far warmer prospect than the pity which is so often what Hardy inspires. It can make for a less perfect story construction (though in Middlemarch, it doesn’t), but it also produces a richer, more human art. And I had forgotten that, because of a silly little thing like a boring sermon. 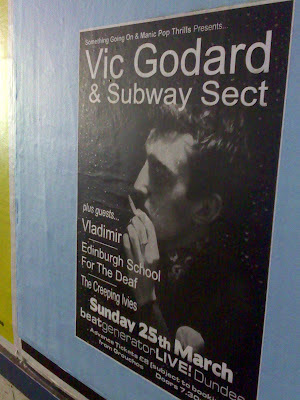 There are shows in Glasgow and Edinburgh preceding it. Also in Dundee this month is an event organised by Mark Wildhouse, with Hookers for Jesus, Metal Rabies and the like. The show he put on last November, which I mentioned in passing but didn’t actually review, damit, was extraordinary. Bringing all that together, via Cold Comfort Farm’s Aunt Ada Doom character and Vic Godard’s ‘Stool Pigeon’ lyric, here is a photo of Aggi Doom playing Sunday’s We Can Still Picnic compilation launch show, in front of the fourteenth century Christian imagery of The Seventh Seal. None of these connections mean anything, you know.